Once you try insalatina di petto di pollo e verdure con guanciale all’aceto balsamico, you may never go back to what you knew salad to be ~ no, really! It is THAT good! Ok, broken down or translated, it doesn’t seem like much; that is why I hit you with the Italian title first, because salad with chicken & vegetables, with bacon and balsamic doesn’t have the same exotic flair! Really, would you stop on the pinterest board that had salad with chicken & vegetables, with bacon and balsamic? No, you’d be thinking, “great! another chicken salad…” Just imagine sitting on a terrazzo, with the gentle breeze tickling the branches of the wisteria vine overhead. You hear the soft tinkling of forks as they graze the plate, and the subtle chime of the wine glass coming in like the last note of the symphony… the beautiful words, insalatina di petto di pollo e verdure con guanciale all’aceto balsamico rolling off your tongue. I think you get the picture ~ TRY THIS SALAD! Preheat oven to 350. Season the chicken breast with salt, pepper, thyme and olive oil. Heat a large oven proof grill pan to medium-high heat. (I spray mine with Pam to keep the bits from sticking). Place meat in grill pan, cook about 5 minutes per side. Place chicken in oven to finish cooking (this depends on the size of the breasts, internal temp needs to be 165). I usually cook mine an additional 20 minutes, remove from oven and wrap each one in foil. This allows the chicken to continue cooking and really produces a nice, juicy breast. While chicken is cooking, prep veg. Once vegetables have been julienned, and cut into 3 inch lengths, place in a large bowl of ice water with a wedge of lemon. This will keep the veggies crisp. Slice the apple and place in a separate bowl of lemon water. Dice the guanciale (I can’t bring myself to say the other), toss in a hot pan; stirring to keep from sticking; cook for about 4 minutes. Turn heat down to medium-low, add balsamic and cook for about 12-15 minutes. Balsamic will thicken slightly…this is good! Slice the cooked chicken breast, 1/4-1/2 inch thick; Keep close, as you’re almost finished! Plus, by now the smells of the guanciale and balsamico have your guests salivating! Now comes the fun part: Construction! On a white plate, start stacking the vegetables in a teepee fashion (trust me). Place 4-6 slices of chicken breast in the same fashion; spoon the beautiful, aromatic balsamico/guanciale over top ~ serve with a “buon appetito” and watch it disappear! Guanciale (Italian pronunciation: [ɡwanˈtʃaːle]) is most often an unsmoked Italian bacon prepared with pig‘s jowl or cheeks. Its name is derived from guancia, Italian for cheek. Guanciale is similar to the jowl bacon of the United States. Pork cheek is rubbed with salt, sugar, and spices (typically ground black pepper or red pepper and thyme or fennel and sometimes garlic) and cured for three weeks. 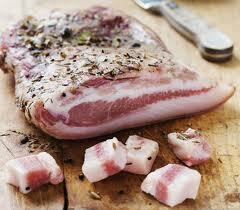 Its flavor is stronger than other pork products, such as pancetta, and its texture is more delicate. Guanciale is traditionally used in dishes like pasta all’amatriciana and spaghetti alla carbonara. It is a delicacy of central Italy, particularly Umbria and Lazio. Pancetta, a cured Italian bacon which is normally not smoked, can be used as a substitute when guanciale is not available.